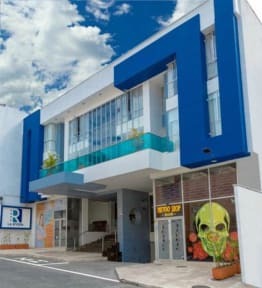 In the centre of the city of Pereira, close to everything with the necessary security to make your business appointments or entertainment plans.In our facilities you will find the comfort and tranquillity ideal for your rest, as well as the attention provided by our highly qualified staff in hotels and tourism. All this and much more offers you The hotel La Rivera, the ideal place for the passage through the city of Pereira bring you the best memories. We wait for you. We are located 3 blocks from the main square (bolivar square) in front of school Carlota Sanchez. The rooms have comfortable beds, with private bathroom, hot water, local calls, WiFi, air conditioning, flat screen television, electronic lock, fridge, minibar and hairdryer. The suites count with Jacuzzi.